CRYSTALS is a software package for single crystal X-ray structure refinement and analysis. The download contains CRYSTALS , Cameron and specially recompiled versions of SIR92 and SHELXS. There are also transparent links to SUPERFLIP (Lucas Palatinus’s structure solution by charge flipping), MCE (a Fourier map and voids viewer by Rohlicek & Husak) both of which are distributed with CRYSTALS. There are links to PLATON for structure validation and for SQUEEZing disordered regions. The PLATON executable must be downloaded from the WINGX website. built-in guidance and validation using ‘The GUIDE’. import and data reduction from many sources: SHELX/XPrep/WinGX format .ins/.hkl files, CAD4 .dat files, KappaCCD import.cif. automatic hydrogen atom placement using combined geometric/difference Fourier placement. fourier maps and contour plots. Output to contour, MCE3D, MapView and ASCII formats. colour thermal ellipsoid plots in Cameron. Output in WMF, postscript, encapsulated postscript, CHIME formats or print directly to a Windows printer. CRYSTALS aims to provide novice users with the expert decision-making tools required for undertaking unsupervised structure determination. We believe that X-ray structure determination should be available as a routine analytical technique for synthetic chemists. X-ray crystal structures provide results that are very easy to understand compared to other analytical techniques, and with modern hardware the entire experiment and analysis can be completed in a morning in a high percentage of cases. Feedback from users has enabled us to significantly improve the ease of use and features of the program. The decision-making system and validation tools are written in CRYSTALS’ own macro language, SCRIPTS, so that they can be modified to accommodate expert knowledge without users needing to become expert programmers or install compilers. 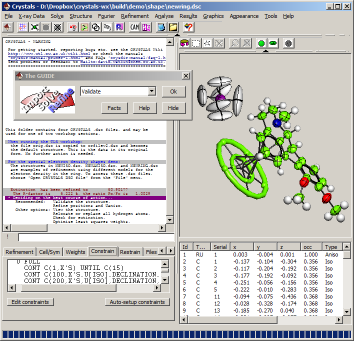 The current CRYSTALS software package is freely distributed over the Internet to any commercial or academic. In addition, since 2009 the University of Oxford has permitted us to distribute the source code. SXtoCRY converts SHELX.INS or .RES files to Crystals format input files. RC93 prepares data for Crystals from a CAD4 diffractometer. DIPin prepares data for Crystals from an Nonuis DIP2000 diffractometer. KCCDin prepares data for Crystals from an Nonuis Kappa CCD diffractometer. CSD2CRY converts CSD files to Crystals format input files. CIF2CRY converts CIFs to Crystals format input files. HKLF52CRY converts SHELX HKLF5 (twinned data) files to Crystals format input files. The programs are currently only available for the Microsoft Windows XP/Vista/7 range of operating systems. There is no up to date LINUX or Mac version available. Now that the the code is Open Source, any programmers wishing to help with porting the code to other platforms should get in touch.